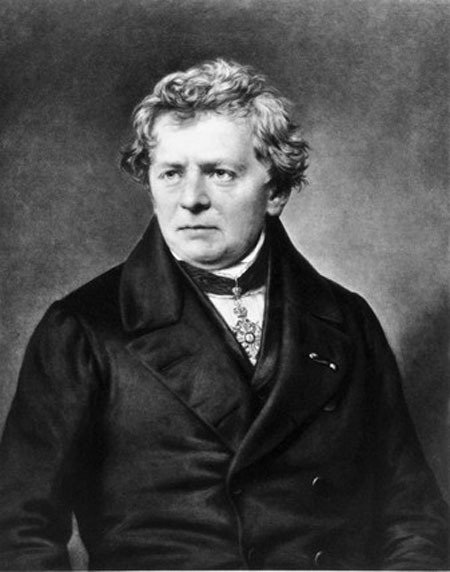 Ohm was born in Erlangen, Germany, on February 16, 1789, to a mechanic father from whom he acquired an early interest in science. He studied physics at the University of Erlangen and held an academic position at Cologne from 1817 to 1826. In 1827 Ohm joined the faculty at the Military Academy in Berlin. That year he announced his most famous discovery, now known as Ohm’s law. His research was inspired by the work of French mathematician Jean Baptiste Joseph Fourier, who studied the physics of heat in the early 1820s. Fourier demonstrated that the flow of heat between two points depends on the temperatures of the two points and on the heat­ conducting capacity of the material between the two points. Ohm predicted that the flow of electrical current between two points would similarly depend on the points’ electrical potential and electrical conductivity. To test this hypothesis, Ohm performed experiments with electricity flowing through wires of various thicknesses and lengths and found mathematical relationships between the amount of current transmitted and these two variables. The relationships led him to establish that electrical resistance within a circuit is determined both by the voltage (the difference in electrical potential) and the current. But the importance of Ohm’s law, which states that current is directly proportional to voltage and inversely proportional to resistance, was not recognized by the scientific community for many years. Ohm took a position at The Polytechnic School of Nuremberg, Germany, in 1833. In 1841 his work began to be publicly appreciated; that year he received the Copley Medal of the Royal Society of London. In 1843 he conducted research on sound and found that the human ear is capable of analyzing the numerous component frequencies present in complex musical sounds. His last teaching post, at the University of Munich, began in 1849. He died on July 7, 1854, in Munich, Germany. Ohm’s work played a significant role in the progress of the field of electricity and in the development of a standard international system of units for energy ­related concepts. Ohm’s work topped off the advances in the understanding of electricity and magnetism that were made in the first quarter of the nineteenth century. In 1800 ALESSANDRO VOLTA devised the first battery, and in 1820, Hans Oersted discovered that an electric current creates a magnetic field. Through the 1820s, MICHAEL FARADAY and Joseph Henry independently conducted experiments with electricity and formulated the principles of the electric motor and electromagnetic induction. In 1827 the accomplishments of ANDRÉ AMPÈRE may have overshadowed those of Ohm. Ampère discovered the mathematical relationship between magnetic force and electric current and distinguished current from voltage. Ohm’s discovery was extended by Gustav Kirchhoff in 1854. Kirchhoff showed that the total voltage driving a current through a given set of connected circuits must equal the total of the voltages opposing it. From this he formulated laws that enabled the mathematical analysis of complex networks of circuits, which made possible all subsequent development of electronic systems. In 1881 the members of the International Congress of Electrical Engineers adopted standard, interrelated international units for measurable electrical properties. The ohm (named for Ohm) was defined as the unit of resistance; volt (named for Alessandro Volta) represented electrical potential; and ampere (named for André Ampère) measured the strength of electrical current. Ohm’s law can be stated as “amperes equal volts over ohms,” thus honoring three pioneers in electricity in one formula.